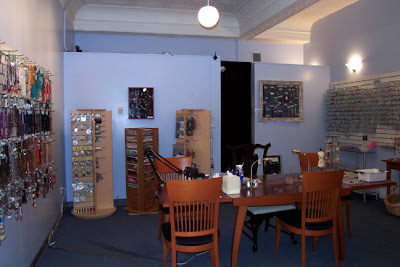 Boston Handmade: Artists and Crafters: Sell More Of Your Work! Artists and Crafters: Sell More Of Your Work! I recently attended a "Best Retail Practices" seminar. One of the interesting pieces from the seminar was to do a "business pyramid", so you can easily see the connection between what you do, what practical things that does for your customer, and the emotional benefits your customer gets as a result. I think this not only works well for retail stores, but also for selling artists. 1) State what you do every day as an artist. Things like, "unlock the studio door and be open for people to come through", "spin yarn", "cut out pictures from magazines" or "cut cloth". List the basic things you do every day that are related to your art. It may even be things like, "list an item to sell on Etsy". 2) State what that does for your customer in a very practical, basic way. I make jewelry as part of my daily tasks. This gives the customer a finished piece of jewelry to wear. In my retail bead shop, I package up beads to sell. This gives the customer materials to use to create their own jewelry. 3) How does that make your customer feel? What is the EMOTIONAL benefit? I think this is an easy question for an artist to answer. Art of any kind evokes an emotional response in the purchaser. Maybe your art makes a customer smile and have a happier day just by looking at it. Maybe it makes the customer feel accomplished by solving a gift-giving problem. Maybe it makes the customer feel pretty to know that she has a lovely jewelry set to go with the dress she is wearing to a party later that week. Think about the emotional benefit YOUR art has on the customer. As a side thought, does your overall marketing strategy (logos, ads, brochure, website) convey this message? 4) What is the special thing that YOU do to give your customer that feeling? Identify and be proud of what you do! We all have that something special that we add to our craft - our strict attention to detail that makes our product that much better quality than the rest, our ability to choose stunning color combinations, our warm demeanor that puts customers immediately at ease, or our great gift packaging are just a few examples. Every artist has something that they do well. Consider your strengths and don't be afraid to make use of them!! We all have to stand out from a crowd somehow. Think about these questions and see how they apply to how YOU sell your art. Are your daily business tasks directly benefiting the customer or the business in some way? Are you meeting your customer's practical needs? Are there ways you can improve your emotional connection to the customer? Can you make better use of your strengths? 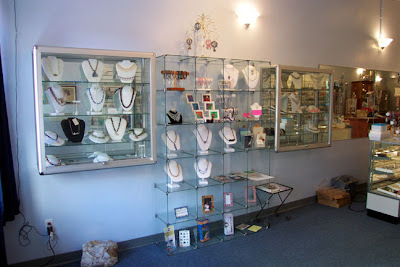 Photos in this article captured by Liz at Lush Beads, a full service bead shop in Lowell, MA.